I wish I could say that I am surprised and shocked. I am not. Just appalled. On another forum I visit, a kid posted a question about his student "aid" package from Cornell Law School. He will end up borrowing a little under $220,000 for his J.D. There was no question that he intends to do this thing. He's out of his mind but forget trying to tell him that; he won't listen. nosborne48 wrote: On another forum I visit, a kid posted a question about his student "aid" package from Cornell Law School. He will end up borrowing a little under $220,000 for his J.D. Can we say, "default?" Seriously, what can this kid expect to make upon graduation? Several times less than the $220,000 in debt? And does the $220,000 include his undergraduate debt? Yet he is apparently Cornell material? Oh, what a bright future this country has. Oh, bright indeed. I keep waiting to read more news stories about people who give up and emigrate to get out from under their student loans. Surely such people are out there. 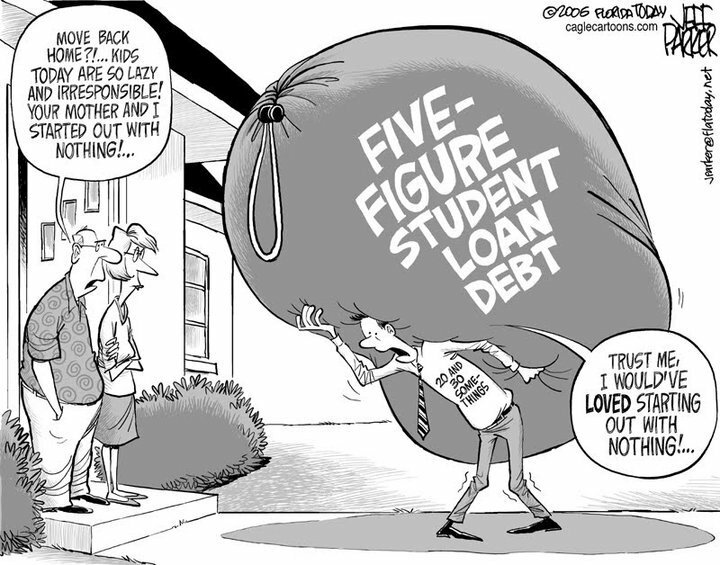 I am not sure you can escape student loan debt so easily. It is true that one nation won't enforce a tax obligation imposed by another nation but general civil debt IS usually collectable. Besides, emigration is not such an easy thing to do for Americans. Young, well educated people might have a fair shot at Canada or I suppose Australia but most countries of the world aren't all that welcoming of immigrants who need to work to support themselves. It's not an easy or simple matter to change one's nationality especially if the main reason for doing so is to avoid paying one's lawful civil debts. Immigrants don't have the right to participate in the political process of the host country and they can be "removed" for the most trivial-seeming of reasons. Americans who move just about anywhere else that's willing to take them will soon find out that their income potential is less, probably MUCH less, in their adopted countries than in the U.S. Their hard-won law degrees are of doubtful value outside the U.S.
Not an appealing life-style, I don't think. No security and the chance of real poverty. No, a better approach for these indentured kids is to give up on the law altogether and go into something else that DOES pay even if it's retail work or something like that. The owner of a McDonald's franchise can do very well indeed. And while they are trying to establish themselves they can also work to change the Bankruptcy Code to allow the relief that virtually every orther civil debtor can take at will. Emigration for well-educated Americans isn't anywhere near as hard as you suggest. I know, I've done it. (Yeah, we're back now, but only for a few more years, and then that's it for good.) Many high income countries have a points system where if you score well enough you're more or less guaranteed to be let in. Some are even more easy -- New Zealand, for example, holds open bar events at their embassies and consulates where they market themselves as an emigration destination, I attended one and they seemed extremely keen to recruit new New Zealanders. SteveFoerster wrote: Emigration for well-educated Americans isn't anywhere near as hard as you suggest... New Zealand, for example, holds open bar events at their embassies and consulates where they market themselves as an emigration destination, I attended one and they seemed extremely keen to recruit new New Zealanders. Here's a potential catch. I've been told -- I can't say for sure, but the guy was otherwise reliable -- that some New Zealanders tend to be very xenophobic. A former workmate, Canadian, spent a couple of years there in the 80s, working for a Canadian-owned company. He claimed many of the people he met hated Brits and people from other Commonwealth countries. He was often referred to (within earshot) as a "Pommy" or even "Pommy Bah-stard" - their derogatory terms for English speakers from overseas. My co-worker said that this attitude was so widespread he was glad to get back to Canada; two years was enough. If that is in fact the treatment Brits and Canadians can expect -- I wonder how Americans get treated! If you're serious - I'd suggest a shorter visit first. johann wrote: If you're serious - I'd suggest a shorter visit first. I assume you mean "If one is serious...." I have my preferred locations already sorted out. I'd also recommend becoming familiar with the New Zealand Foreign Judgments Act (if there is such a thing. I'd bet that there is.) You might discover that Sallie Mae can indeed reach across the Pacific. The page ends with the info that U.S. judgments are enforceable at common law in New Zealand. ..And yes, Steve. That should read "if one is serious..." I'm sure you didn't have THAT many drinks at the NZ reception! I'm thinking of Mongolia, myself. I have no judgments to evade, but there's about the same sheep-to-people ratio as NZ! johann wrote: ..And yes, Steve. That should read "if one is serious..." I'm sure you didn't have THAT many drinks at the NZ reception! Well, I can't remember it, so I must not have, right? Actually, you could do much worse! There are a lot of Mongolians at the school where I work now, and they're an intelligent, friendly, and attractive group of people. SteveFoerster wrote: There are a lot of Mongolians at the school where I work now, and they're an intelligent, friendly, and attractive group of people. I'm glad to hear it, Steve - and hope they all do well. I've had a minor fascination with Mongolia for some years. The idea of that much space and that small a number of people appeals to me. Nowadays, Mongolia does suffer quite a bit from an influx of pesky Westerners of several stripes, who have mostly moved in to "develop" (i.e. corral) its immense mineral resources. Result: One could easily spend a big bundle for an apartment in Ulan Bataar - or however we spell it these days. Of course, if one prefers, one could live in the windswept country in a felt-wrapped ger. Don't call it a yurt - that's a Russian word. Speaking of Russian, Mongolia used a modified Russian alphabet for 75 years while under Soviet purview. They're now re-embracing the beautiful "classic" script - taken from the work of one Uighur scribe, captured by Genghis Khan - Tatar Tonga was his name, IIRC. I know hardly any of the language beyond Sen baina u? - How are you? Perhaps one day, I'll do better. One Mongolian season I don't really enjoy the prospect of, though: June and July - high PLAGUE season!